Is anyone a little sad that this project is halfway over? I know I am, but I am even more excited to see what each day will bring. Today’s it’s Lisa, The Bearfoot Baker, one of my nearest dearest friends. Sometimes I don’t know how she puts up with my cookie craziness, but I am glad she does. Here’s Lisa and her breathtaking interpretation of seven swans a swimming! I can’t even begin to tell you how fun this project was. 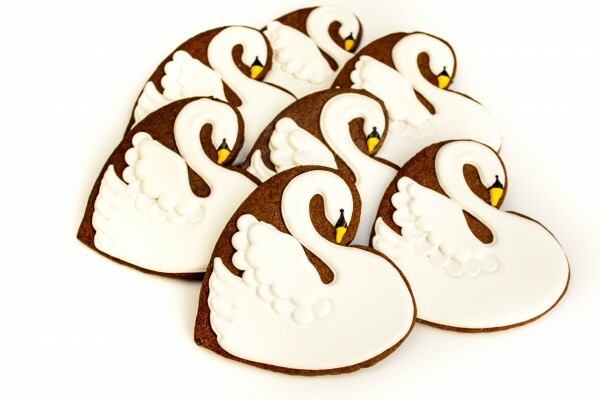 When Callye asked me to make the swans for the 12 Days of Christmas, I actually squealed with delight! I was a little worried I scared her but thank goodness she has nerves of steel. Before I started my design, I made a couple of goals. 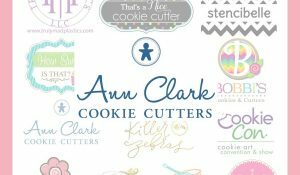 My first goal was to use a cookie cutter everyone had and make the design pretty and simple. The second goal was to make a cookie that would last in case anyone wants to make an ornament out of it. We all know that white and black icing don’t play nice together. I hope you like what I came up with. 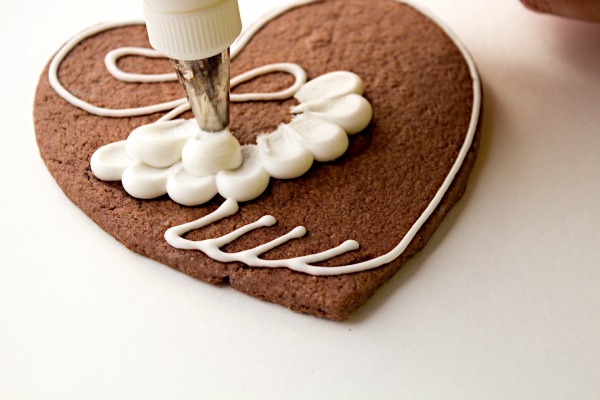 First, trace the design onto the cookies with a yellow food safe marker. I had to use brown for the picture so you can see it. If you want a pattern so all your swans will be the same size, click HERE. 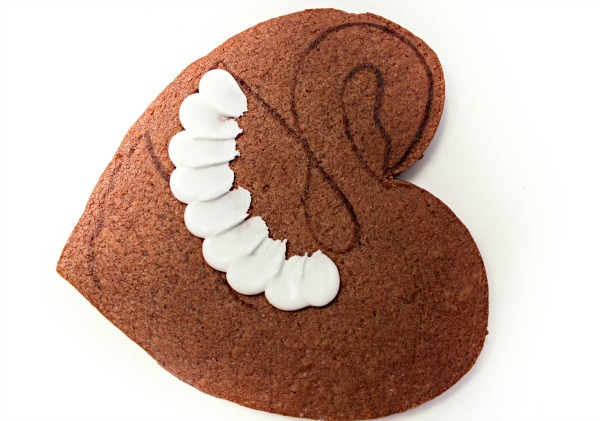 You may need to re-size it to fit your heart shaped cookie. Then, with the thick white icing, make the feathers on the wing. 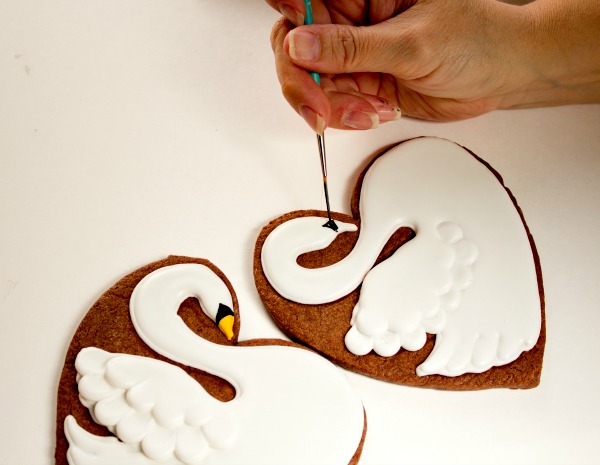 To do this, hold the piping bag straight up and down, squeeze to make a dot and then pull it down and toward the swans head as you release pressure. You are basically piping a tear drop shape. Let this dry for a couple of hours. We don’t want it to get smashed when we add the next layer. Next, with the flood icing, outline the swan. To make the second row of feathers as full as the first row, we are going to blend the thick and thin icings together. It is easy so don’t worry. Make a second row of feathers with the thick icing just like you did for the first row. Don’t let them dry. You need to work a bit fast here so stay with me. Pipe the flood icing on top of the feathers one at a time. 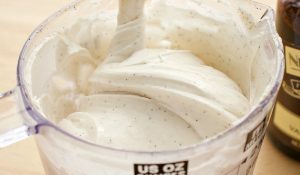 Blend the thin icing into the thick icing until it looks smooth. I inserted the piping tip slightly into the feather and made a small circular motion until it blended. Be careful not to overwork it because it will lose it’s shape. Once you have the feathers, flood the wing and the rest of the swan. Flood the wing and the body at the same time so it will look like the wing is attached to the body. 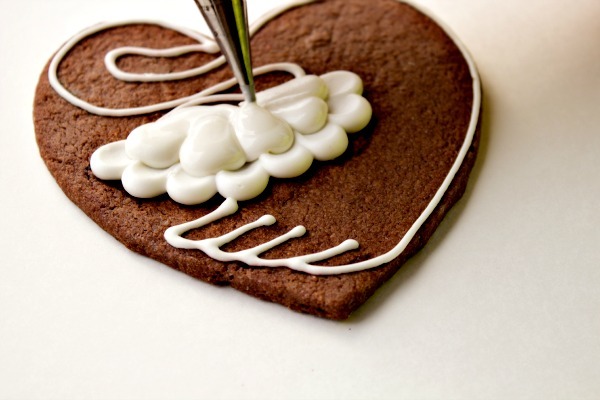 Have you ever painted on a cookie before? Well, thanks to Arty McGoo, a new world of decorating has opened up for us. Now back to the swans. You don’t have to stress an exact brush for this project. You just need one that can paint a thin line. Mix a little water to drop of black food coloring gel. Then, paint a triangle on the swans face. It is not hard I promise! And the best part is, it won’t bleed onto your white icing. Once you paint the black triangle, paint the bill yellow. Then make the eye using the tip of a Boo Boo stick or a toothpick. Dip the tip into the gel and touch the cookie where you want the eye. 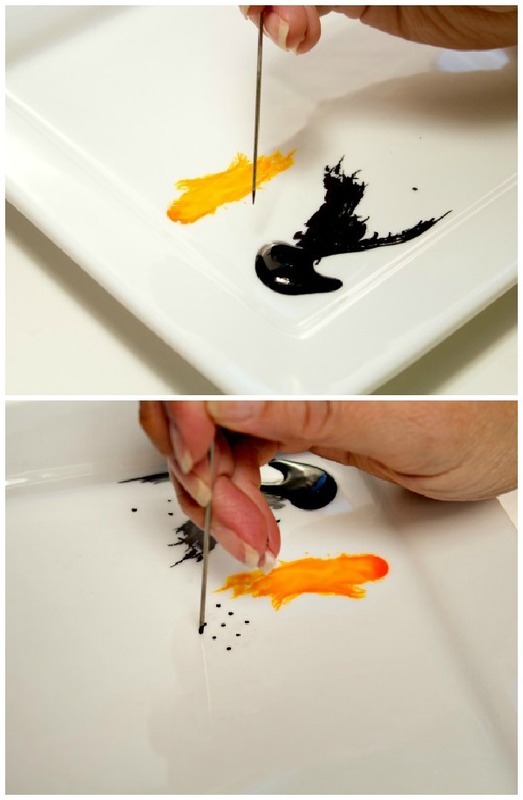 Practice on a plate or parchment paper if you are nervous. Thank you so much Callye for inviting me to take part in this festive project. 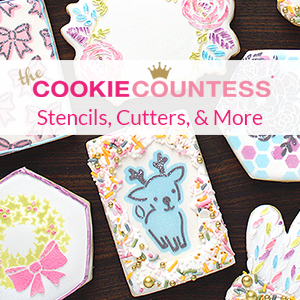 It is an honor to make Christmas cookies with such amazingly talented cookie decorators. I don’t think you know how much the 12 Days of Christmas means to me. Our family actually does something special for it but, it’s too much to explain here. If you would like to know our tradition, click here. These guys are magical! You captured their grace perfectly from their beautiful faces, to their elegant curve in their necks to those gorgeous ruffled wings! Such beautiful work Lisa!!!!!!!!! So beautiful and elegant! 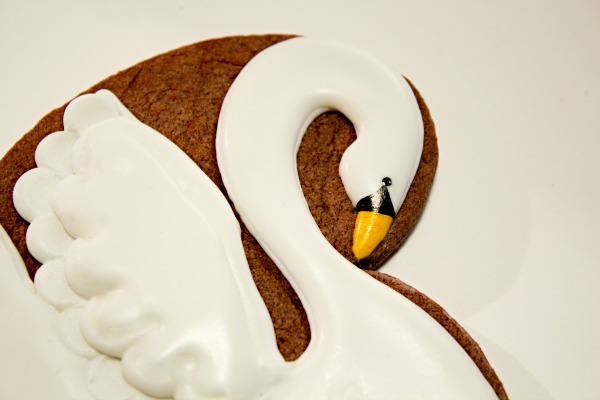 Great choice to use a dark cookie to set off the beautiful white swans! Lisa is one of my favorite decorators and a sweetie!!! 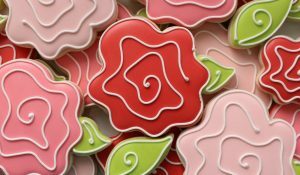 I love this post because it introduces new techniques…..and a new tip…the num. 12 which I’ve never used!! Gorgeous! Can you tell me where you got your scribe? I have been looking for one online (I live in the boonies) and haven’t found one…but I’m seeing lots of delicate detail work being done with scribes lately. I need one! I have so enjoyed watching the 12 Days of Christmas unfold. 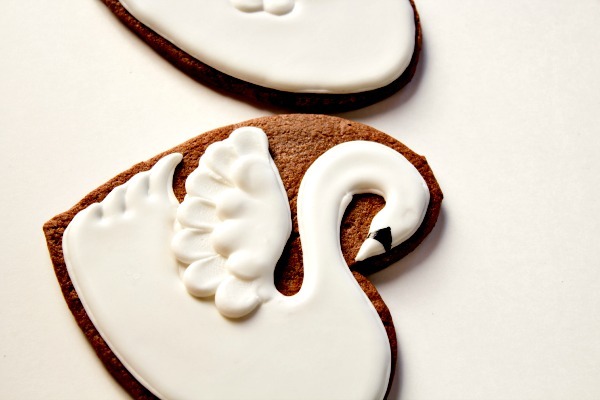 Beautiful swans…I may need to make a couple just to say I could! Excellent tutorial. Wow, the wing technique is awesome and they look so gorgeous! I love the simple elegance – thank you for sharing! BEAUTIFUL! The whole design is dreamy and ethereal and then it’s on a heart cutter?! Who doesn’t have a heart cutter? I love it! I can’t get over those wings! And Ms. Lisa: you have mad painting skills. Completely gorgeous cookies ma’am. I am sad that the 12 days are half over. I know I won’t be sad for long because you will have more cookies to entertain me with! 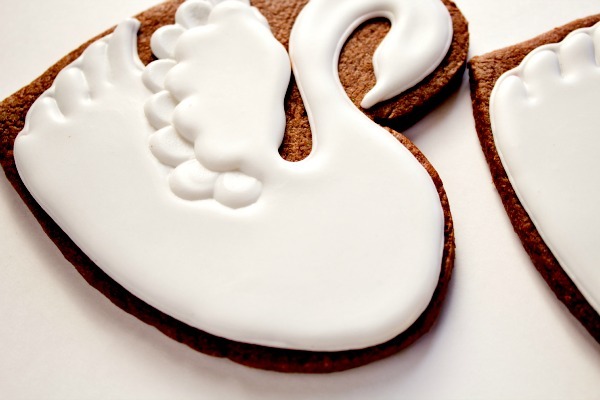 These Swans are just exquisite and the white on the chocolate cookie looks awesome! 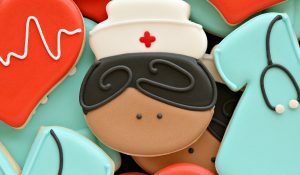 These are elegant and beautiful and I’m loving the fact that Lisa created these on a heart shaped cookie. 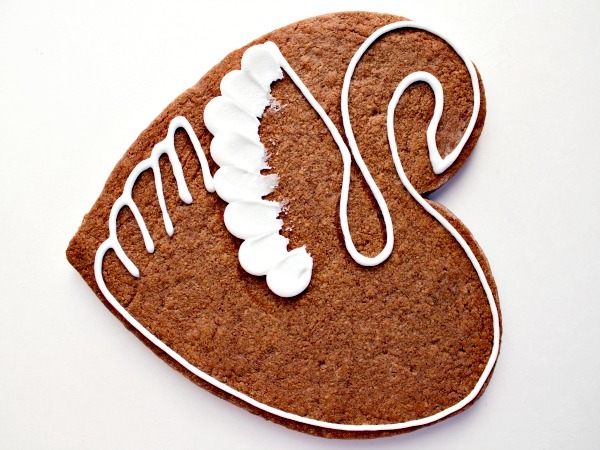 I absolutely LOVE this cookie – I am also a ’12 Days of Christmas’ nut!!!! These are fantastic!! Thank You! I have to try to make these, hey are just too much fun!! Thank You!! What a great tutorial!! The swans are gorgeous and I love how you did the wing. I’m doing some scales for a fish cookie this week and I’m going to use some of these fresh techniques! Thanks, Lisa! These are just beautiful, Lisa! I would never see a swan in a heart – you’re so creative to come up with this idea! Stunning! I just came across these and they took my breath away.